Paige's Page: Frame your Garden Contest. Sharpen your spades and quills! It's gardening time around the Spiral! How does your garden grow contest From May 1, 2013 - May 22, 2013. Decorate your own Wizard101 Garden then make a special picture of your garden like I did for banner. You may use kizoa.com If you like they have some really nice frames or make one yourself. 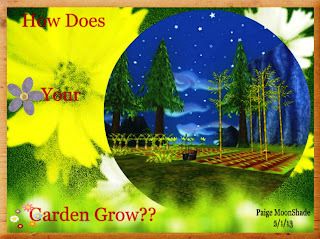 * Create and decorate a Wizard101 garden. * This contest begins May 1, 2013 and ends May 22, 2013 at 6pm(Wizard101) Central time. * Take a screenshot of your garden and frame it how ever you like. * Send your framed picture to Contest@paigemoonshade.com with title "Frame your Garden." * Codes are one time use, and may only be used one per account. Hey Paige, I have a quick question. Does it matter if the garden is made out of harvestable plants or can we use housing objects like in the example? How ever you like I made the garden in the photo before there was even live gardening ingame. I am really proud of that garden Because I made it way before gardening. hi Paige I have a question. Does our character and it's overhead name have to be in the picture of the garden? Thanks for hosting this contest!!! How do we make our own frames? There are so many sites you can make frames from. The one I gave has some free frames. You could also use a photo editing to create a frame. Marleybone and Aquila Live!!! NEW Crowned Items! !